See the polenta browning in the background? Kale, mushrooms and bacon are sautéeing in the foreground. Kale! It’s everywhere these days! 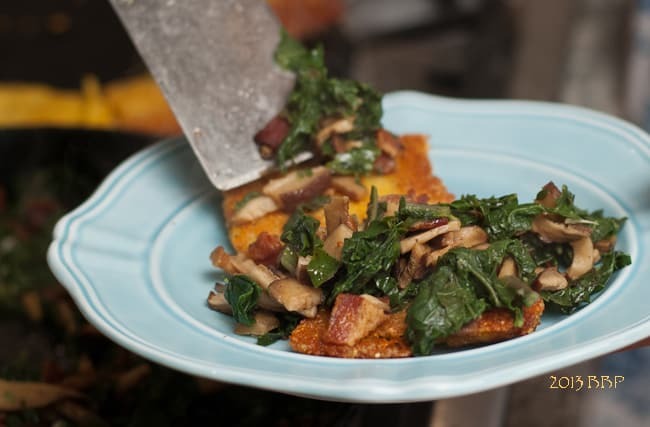 This recipe for Kale, Mushrooms & Bacon Over Grilled Polenta not only offers a delicious way to serve kale, it also shows you how to make polenta that is crispy, creamy, and cheesy. I promise you, if you like kale, you’re going to love this recipe. 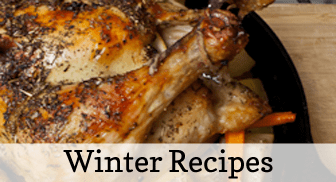 Comforting, warm and satisfying, this dish makes me feel cozy. 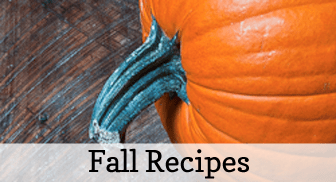 It’s a perfect fall or winter meal. The grilled polenta is a little effort, but so worth it. Crisp and crunchy on the outside, it’s tender, creamy and cheesy on the inside. (And I just made my own mouth water.) If you go to the effort, your reward following this meal will be leftover squares of cheesy polenta, that you can cut, refrigerate in a container (I separate my rectangles by layers with waxed paper), and enjoy for days to come, either as a side dish for other evening meals, or as an awesome accompaniment to an egg: poached, or sunny-side-up. Polenta is frequently served soft and creamy. You could do that in this dish, as was done in the dish that inspired my version, but my recipe calls for the polenta to be grilled or sautéed. That’s what pushes this meal over the top, and into nirvana, if you ask me. So, by all means, if you’re going to make polenta, go the distance, and try it grilled/sautéed. You can thank me later. I may have an unfair advantage on some of you, in that I have a mill, that grinds my popcorn into the world’s best cornmeal/polenta. So, if you have a mill, by all means, get some unpopped popcorn, and grind those kernels up into your own cornmeal. It makes cornmeal that is super sweet and flavorful: the best you will ever have. If you don’t have a mill, use stone ground cornmeal. You don’t have to buy something that “says” polenta, but is actually just overpriced cornmeal. Just get cornmeal that is fairly coarse in grind (nothing too finely ground). Make the polenta earlier in the day, so that it has time to chill, and be firm. (You’ll need to refrigerate it for at least an hour for it to firm up.) Then, you can cut it into the shape and size you desire. If it were Valentine’s Day, or someone’s birthday, for example, you could cut your polenta into heart shapes. And wouldn’t that be sweet? 🙂 As for me, rectangles suit me just fine, and I cut mine about the size of a deck of playing cards. 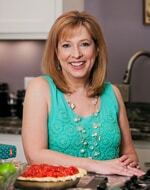 You may vary the size for your family, depending on how big a portion you’d like to serve. 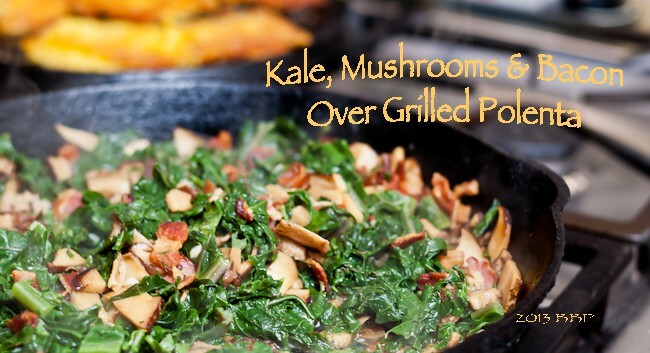 Grill or sauté the polenta while you’re sautéeing the kale and mushrooms. That way, they’ll both be ready about the same time. Bring 4 1/2 c. chicken stock to a boil, and add salt, and polenta, stirring constantly. (This is the stage where the polenta can lump, so keep stirring.) Cook over low heat till super thick, and polenta begins pulling away from side of pan. Polenta should be so thick that a wooden spoon can stand up in it. This takes a while, probably about 15 or 20 minutes. Remove from heat, add butter and grated cheeses. Stir until both are melted. 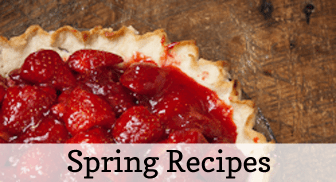 Taste and season with salt if necessary. (The Parmesan cheese will be salty.) Spread polenta into a greased jelly roll pan. cover with plastic wrap and refrigerate until firm. Cook kale in a large pot of boiling salted water, until tender. This will take about 6 minutes. Drain. Cut polenta into desired shapes, brush with olive oil and sauté on a cast iron griddle until the polenta becomes golden brown and slightly toasty. 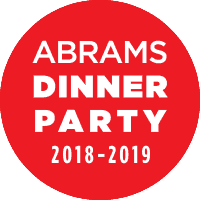 It will take about as long to sauté the polenta on both sides as it takes to sauté the kale and mushrooms, so begin browning your polenta shapes right before you begin cooking the kale and mushrooms. Flip the polenta whenever the color looks perfect to you, in order to brown them on both sides. 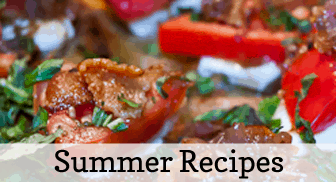 Cook bacon in a large, heavy skillet until beginning to crisp. Transfer bacon to paper towel to drain. Add mushrooms and 2 T. olive oil to drippings in skillet. Sauté until mushrooms are tender, about 6 minutes. Stir in kale and bacon. Add garlic and sauté, 1 minute. Add 1/2 c. stock, and simmer until stock is slightly reduced, about 6 minutes. Stir in thyme, lemon zest, and 2 T. oil. Season to taste with salt and pepper. 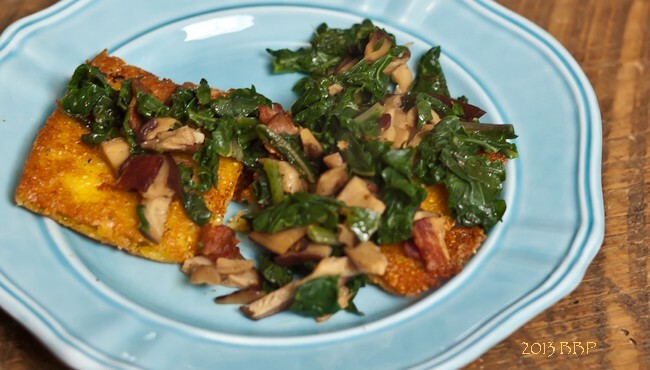 Serve kale, mushrooms and bacon over sautéed polenta. See the crispy, golden crust developing on the polenta cooking in the background? 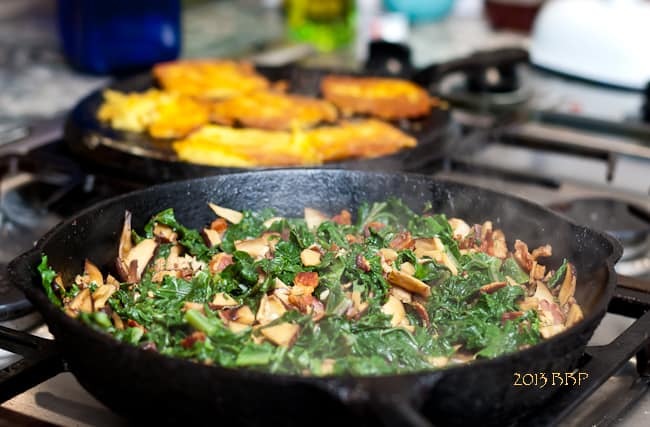 Kale, mushrooms, and bacon are sautéeing in the foreground. How about you? Do you love kale? I’d really appreciate it if you’d pin this picture on Pinterest! This recipe for Kale, Mushrooms & Bacon Over Grilled Polenta gives you polenta that is crispy, creamy, and cheesy.